Knowing what a VIN number is can be especially helpful when getting a quote for car insurance, buying a new car, or researching a used car you’d like to buy. Don’t be caught off guard when you head out to the driveway, parking lot, or garage to find it! 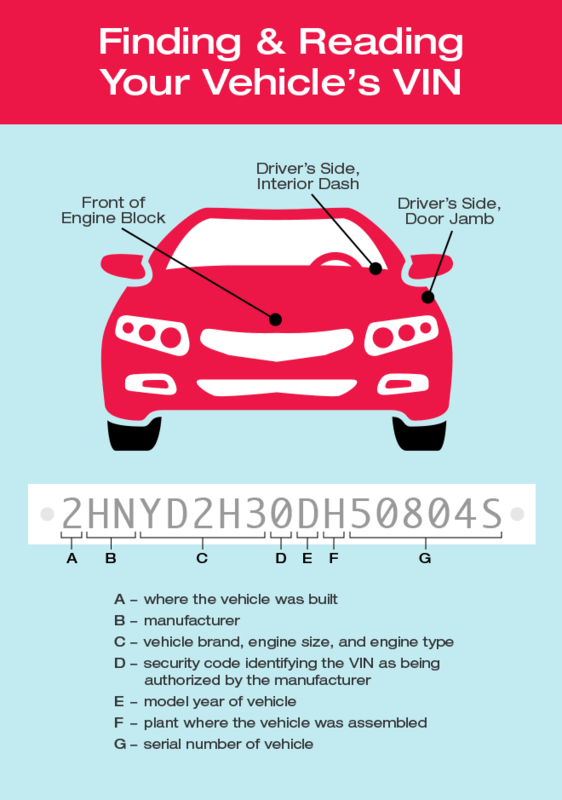 Learn what a VIN number is, where to locate it, and why it’s important. VIN is an abbreviation for vehicle identification number. It is a series of 17 numbers and letters that an automobile manufacturer assigns to an individual vehicle. Every VIN number is different and a VIN number will not change during the lifetime of a vehicle (kind of like your DNA–it’s unique to you and never changes). Vehicles that were made prior to 1981 may have less than 17 characters. Where is my VIN number? What do the numbers and letters of my VIN mean? How is a VIN used? VIN numbers are used to track a vehicle as it changes hands and is repaired or serviced. Prospective car buyers can use a VIN number to generate a vehicle history report (via CarFax or the National Motor Vehicle Title Information System) to learn more about a car’s service and repair history, and to uncover any potential safety issues, like an outstanding vehicle safety recall. Also, auto insurance companies will require your VIN when you purchase a policy. Why? In order to accurately track the history and features of the car, match it with its owner, and check to see if the car has ever had a salvage title. Why is my VIN number important? Your VIN number is important for a number of reasons. First, your state’s department of motor vehicles may check your car insurance information before issuing your vehicle’s registration tags. If you list a different or incorrect VIN on your insurance documents, your state’s DMV may consider your car uninsured and refuse to register it. Second, safety recalls are tied to a vehicle’s VIN. A safety recall is issued when a vehicle (or part of a vehicle) fails to meet federal safety standards. Many car owners have no idea that a safety recall was issued for their vehicle, especially if they bought it used. According to CarFax, more than 47 million vehicles have at least one open safety recall. Is your vehicle one of them? Enter your VIN at SaferCar.gov to double check! Now that you know where to find your VIN, how to read it, and how it’s used, it’s time to put that know-how to good use! Go outside, snag your VIN, and see how affordable your car insurance could be when you get a quote for car insurance with Direct Auto & Life Insurance!